The Floating Putty Buddies Ear Bandit ® really do float! These colourful, soft silicone plugs are larger than most other child-sized silicone plugs to completely fill the outer ear, providing a watertight seal over the ear canal. 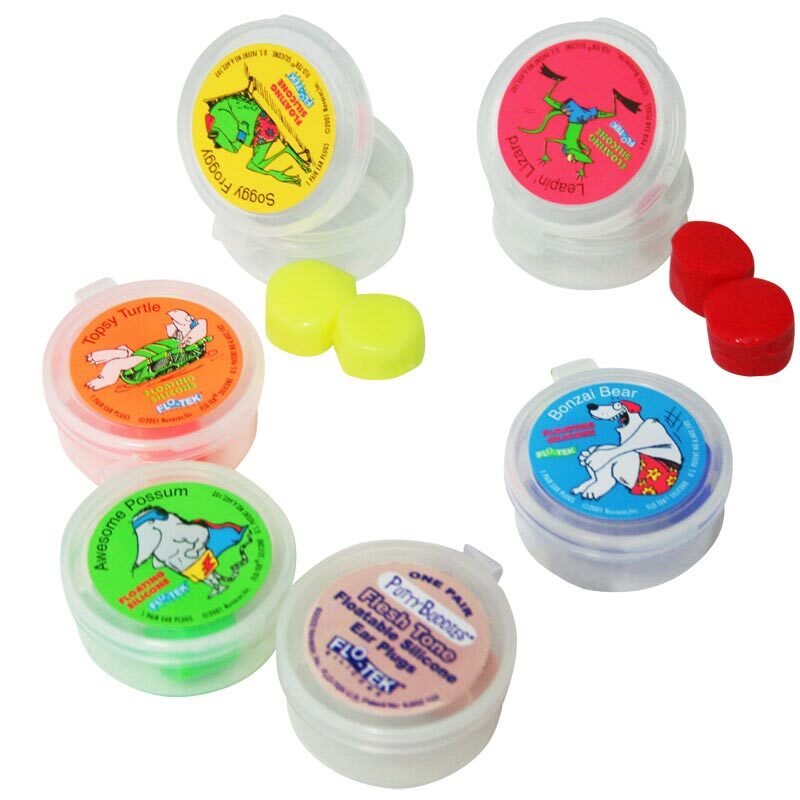 The system using an Ear Band It with Putty Buddies Ear Plugs was originally designed by an ear, nose and throat specialist to prevents ear infection for his young patients with ear tubes to help keep the Putty Buddies plugs secure, even during vigorous activity. Suitable for all ages from new born to adult. (Younger users should be supervised). Great product - such good value too. We’ve been able to keep swimmer’s ear under control using these ?? An excellent swim aid for holidays and training. Very comfortable and effective! The ear plugs are fab for my son when he goes swimming. Due to having a perforated ear drum he needs plugs ando a headband while swimming and in the bath/shower. He can independently use these. Arrived on time. Product is great. Feel totally safe going in the water. My son, who has grommets, has been using these for the last year when he goes swimming and for hair washing. The putty is easy to use and comes with a handy storage box. Great value from Newitts too. I have tiny ears as an adult and these were the best nothing else has worked. You can reduce the amount you out in your ear by rolling a different sized ball. I used to order these from the USA and when I came across them on this site for that price .... I couldn't believe it! AMAZING!!! I have to use ear plugs everyday, my ENT recommend me to use this kind as they are soft and are truly great quality! I used to by the clear ones but found the Flotec ones better and last much longer! My little boy suffers from ear infections and so we use this all the time in the bath, shower and swimming pool. It works perfectly, keeps the water out and stops the ear infections from occurring. 4 out of 5 Do the job! The ear plugs stay in my daughters ears and come out easily enough after use. Just get a bit stuck in her hair! I have purchased loads of these ear buddies for my 7year old Daughter, after she experienced yet another troublesome ear infection, due to having grommets. They really helped a very very keen swimmer, to continue the sport she enjoys. My daughter found them very easy to use, and could still hear instructions, well done ear buddies, they even stayed in place whilst diving. I would recommended these to anyone. Thank-you. The ear plugs I bought for my son work wonders. Not only do we use them for swimming to protect his ears we also use them to block out noise. My son is autistic and can't deal with busy loud noises, these work a treat. These ear plugs are easy to use. They keep the water out of my ears and are very comfortable to wear. My six year old daughter had had numerous ear infections and these are great for protecting her ears when swimming. We use with the ear-bandit. I started using these and I cannot recommend these enough. They seal your ear keeping it dry. Mine stayed in my ear and are still pliable today. I have ordered two more pairs as I wanted variety to go with my swimsuit!!! I have ridiculously small outer ear canals, which means that most ear plugs become extremely uncomfortable, very quickly. But I'm also a very light sleeper, so this ear putty is absolutely brilliant for blocking out louder sounds that stop me sleeping - I don't know what I'd do without it! My 9-year old had a grommet fitted in so I bought a pair of these. It's like play-dough so it does stick to hair, can also break off in bits and get dirty (not possible to clean it). The good thing is that it's moldable, but still it sometimes slips out when it gets wet. 5 out of 5 Ear Buddies. I purchased these ear buddies for my 9year old son, after he experienced yet another troublesome double ear infection. They really helped a very keen swimmer, to continue the sport he enjoys so much. My little boy found them very easy to use, and could still hear instructions.well done ear buddies, they even stayed in place whilst diving. Thank-you. Our daughter missed so many swimming lessons due to ear infections that these were our last hope and they are great. She has not missed any lessons since using them, would definitely recommend them. Using buddies ear plugs has been a great health benefit for me. I used to suffer from repeated ear infections, but the buddies ear plugs keep my inner ears dry and infection free when I wash my hair. I was very unsure when I purchased the first two pairs. At first, I felt it awkward to get it in place as it often stuck to my finger. The plus side, they don't hurt the ears and my 4yr old grandson can put his own one "in". I bought these ear plugs for my twins swimming lessons, as they kept getting ear infections ! They love the bright colours and happily put them in for each lesson and the best bit so far no more ear infections! newitts were brilliant and sent them very quickly, and so we were able to use them ASAP. My son of 7 has had gromits fitted recently and has used his ear plugs for both swimming and bathing. They are fantastic staying in his ears and having no problems them falling out. I purchased these plugs along with the Ear Bandit and am extremely pleased with the product. My son wouldn't go swimming before he got these, now he has no problems! They stay in really well, though we use the band just as extra security. Would certainly recommend! Easy to fit and to remove. Fantastic! Excellent product. Fit is perfect as you mould them to completely in the ear unlike other silicone earplugs. The only problem we had is that sometimes it got bits stuck in my daughter's hair but it really isn't a problem as they do exactly what they are meant to. My daughter (3) loves swimming, but she is quit prone to ear infections. After searching shops for some ear plugs for her and not finding any I came across these online and they are great. They fit into her ears really well, but as they are putty-like would also fit in a bigger ear. Because they are brightly coloured she likes them & they would be easy to find if they fell out in the pool, but they have never fallen out anyway. We have two pairs now after I lost our first pair. Would definitley recommend. my son just had gromets in his ears and needed to keep the water out didnt want him to stop swimming lessons so got told about these,.. very very good and the kids love the colours..!!!!! I think this product is great. They are easy to use and comfortable to wear. Even come in their own little box. 4 out of 5 Great for the price. Comfortable. Work very well considering the price. Used them 4+ times without any issues. The only thing is that hair gets stuck to them, but it's not a big deal. A fantastic product really easy to use, my son is 7 and wore these without any complaint. Would thoroughly recommend to anyone. Second time I've bought these, great for kids with Grommets. My son loves the illuminous green ones. Handy for swimming or just a shower. Have been using these along with the headband for the past 4 years. These are very very good and we find that other ear plugs are not as effective. Daughter loves the colours and the little pot they come in is handy to pop in your pocket. She has been able to swim twice a week without any problems and without these that would not have been possible. I got these for my daughter who had recently had grommets put in, they are perfect and easy to use! My daughter loves the bright colours too! This is also the cheapest place I have found for them! I would fully recommend them as my four year old little boy was fine using them for in the pool on holiday and he loved the little case they came in. An excellent product used by my daughter for synchronised swimming. They are the only ear plugs that we have any confidence in and were recommended by her ENT consultant. Without them she would be unable to participate in this challenging sport. My 4 year old daughter had gromits and having done swim lessons since she was 2 we didn't want her to have to give up. I was going to pay for ear moulds at £65 but thought I'd try these 1st. My daughter put them in herself and removes them herself and is so happy wearing them. She didn't wear the bandit as it interfered with her goggles but the plugs don't let anything in so they are ok on their own. She jumps in, dives under and is fine. The only thing is to make sure hair is tied and clipped back as otherwise small strands of hair stick to the plugs and this can make removing the plugs a little painful as you pull hair. Now she has her hair clipped back she never ever complains and always does them herself. The plugs are good for about 1-2 months but I then change them as I figure they may be getting dirty. Still cheaper than paying for moulds even if you change them after every use!